Home / Automobiles / Business and Marketing / How to beat the January Car Price Hike ghost! Almost every car manufacturer ‘secretly’ leaks information that there will be a price hike from January. Dealers work overtime in December to scare prospects about the impending price hike and how a smart decision it will be to conclude all paperwork in December itself at current rates and ‘save’ big time. Many car buyers fall for this trap, end up buying a car in hurry to save a few thousands, usually buying a car that is not best suited for them or feeling regret that they could have waited for another 3-6 months instead of buying in a hurry. The January price hike is a systematic psychological approach adopted by all car makers to convert those indecisive customers sitting on fense. It is not like from January car sales will plummet because of price hike- within a month or two it is back to business as usual, except that those who bought in a hurry in December will be left to wonder “Why was I taken for a ride in December”! 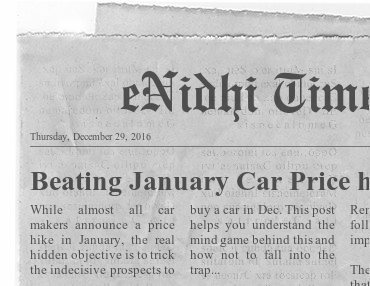 This post explains how you can get around with “January Price Hike ghost” released by almost all carmakers. While price hikes are usually announced officially or leaked unofficially weeks in advance, price drop is never communicated in advance. Have you ever seen a manufacturer announce “From next month price will drop, don’t buy this month”? No. Price drops are usually immediate. Only for hikes it is other way round, so that it will force lots of prospects to make a decision and close the sale. December is a month where car sales will be at its lowest. A car registered on 2016 Dec 31st carries much less resale value than car registered on Jan 1st 2017, because of difference in year. Unless the discounts/incentives are great, customers prefer to avoid new car purchase in December, forcing dealers and manufacturers to pull various tricks in the book to meet their monthly target. Jan1st Price hike scare is the most effective of them. It is not like hiked price in Jan will prevail for whole of next year. By the time March/April comes, festival season begins and car manufacturers start offering various discounts and offers, effectively making the net price at par with previous year December prices. Thus instead of getting scared that cars will be expensive from Jan, delay your decision by a few months, buy during March/April festival offers. Step 1: Ask yourself- Do I badly need a car right away or can I afford to wait a few months more. If you badly need a car and can’t afford to wait for few more months, then go ahead and purchase in December. Step 2: Ask yourself- Is this model I have shortlisted is best suited to my needs and aspirations or I am buying this for lack of a better option? It is advisable to buy the right car, even if it costs a few k more, than buying a wrong car at lower price. If the car you’ve shortlisted doesn’t meet all your expectations but you’ve thinking of buying it anyway as there’re no other alternative and you don’t want to wait fearing a price hike, then wait. Do some more research, wait for few more months and you are very likely to get a more suitable car. It is fine to pay little more to the right car. If you end up in a situation wherein every morning you sit in driver’s seat you feel guilty – “should have bought the other one” then it spoils the whole car ownership experience. If the hike is just about 2-3% it doesn’t make huge difference for a small car/sedan. The better resale value will compensate for it when you sell of your car. When there is a price hike scare and customers are rushing to close the purchase in a hurry, dealers may cut back on other offers- such as free accessories, discounts on insurance, interest rate, processing fee etc. Thus your net gain may not be much. In January also they will have targets to meet. With most customers having bought in Dec in hurry, Jan sales will be low- though car price is higher, you might be able to pull some strings and get some free accessories/discounts on insurance/interest rate etc. Don’t lose hope, Don’t buy in a hurry. If there is a new launch expected, price of competition brands might even drop in new-year. Keep your eyes and ears open on the net for upcoming launches of next year. If not a gain in price, the new model will give you more options to consider from- it may have better design/fuel efficiency/features than the current model you are about to purchase. If nothing else, at least you can demand some extra discounts from your dealer saying else you will wait for this new model. Do not get scared by the price hike news and never buy in a hurry. The value of price difference can be recovered in multiple ways. Understand that dealer’s interest is to close a sale “NOW”. They will never advise you to wait for few more months, no matter what. You should do your research and decide if you need to buy now or can wait for a few months. Car is a depreciating asset. Loses money (resale value) every single day, costs money to maintain (insurance, service etc). More you delay its purchase, higher will be your savings. P.S. Same applies for budget season. Many leave a feeler that more taxes will be imposed post budget and you should hurry and buy at pre-budget rates. My simple advise is don’t get carried away- if you’re spending 5 to 10 lakhs on a car, be sure that you buy the right car at right time. A price difference of +/- 2 to 5% is perfectly fine if the car is right and you don’t have to regret your purchase made in a hurry. Do you agree? Do you have a different point of view or additional tips to add? Please do comment. Important post.. Sharing this on my social media.. Thanks..
@Swati- hmm, never thought about it..